There are many ways of washing your face and one of the most common is to lather a facial cleanser on your palm and apply to your face. One step up in a face washing routine is to use Face Wash Net. 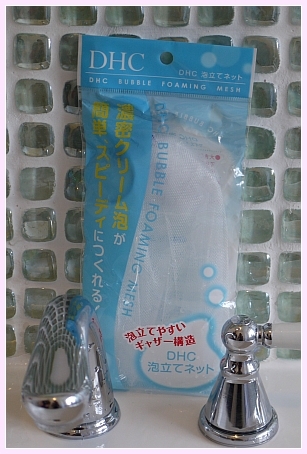 It is well known and widely used beauty tool in Japan that helps to form a creamy, fine, dense lather/bubbles. 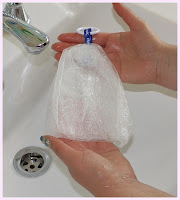 The reason why this way of washing your face is so recommended is because using a net creates dense whipped like foam that is impossible to achieve by just using your hands alone. The foam is supposed to clean your face better and really get into the pores. Density of this form then creates a cushioning layer that prevents harsh rubbing on your skin, therefore even someone with a sensitive skin could use it. 4. Gently massage with fingertips onto face and just wash off with warm water. By the way, DO NOT use this kind of net directly on the face as it is too harsh. I find trying out Asian skincare and tools so much fun, as they always seems to be ahead of the game compared to what we have here in the UK. Maybe this might become trendy here soon too... I have seen this kind of a foaming net in Muji shops in London (www.muji.co.uk). I bought mine online.